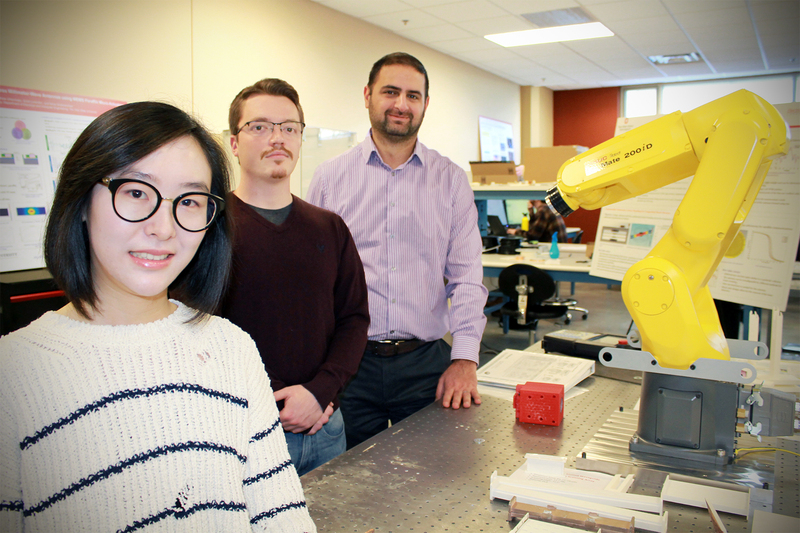 Shangyi Chen, Mark Lust and Nima GhalichechianNew research at The Ohio State University could help lead to a new generation of radio frequency devices capable of advancing space communications, smart phones and even self-driving cars. Passive imaging sensors gather and record naturally emitted or reflected energy from around them. For example, when the camera shutter opens on a digital camera, the array of sensors inside records the intensity of light striking them. The sensor passively collects light measurements, and the data is processed into images. Instead of sensors detecting optical light, Ghalichechian said, their work can lead to detecting electromagnetic waves. Applications of this research could advance medical imaging, navigation, remote sensing, and robotics, to name a few. The work is interdisciplinary and centers upon using novel material properties to address the ongoing limitations of current millimeter-wave devices, he said, such as sensors and antennas. The millimeter-wave band is defined as frequencies between 30 to 300 GHz. Ghalichechian said phase-change materials, such as vanadium dioxide or VO2, have been around for more than 50 years, but their uses remain elusive, especially when it comes to applications in the millimeter-wave band. Their work, he said, is to address these limitations. Phase-change materials are ideal for millimeter-wave reconfiguration as they provide a path to achieve low-loss microsystems. “The proposed work is ambitious but potentially transformative as it challenges the conventional wisdom in designing sensors and dominance of semiconductor-based millimeter-wave detectors. Currently, no acceptable solution is available for millimeter-wave imaging systems operating at the room temperature,” Ghalichechian said. As an undergraduate, Lust said he developed a “recipe” to deposit films on materials using “reactive sputtering,” which is when vanadium atoms are ejected from a target and react with oxygen to form VO2 on the substrate. His work also improved accuracy for phase-change measurements post deposition. Lust said his role in the project is to further analyze the recipe he created for depositing VO2 films on antenna arrays. Meanwhile, Chen is studying and exploiting the electrical properties of VO2. She is designing a highly sensitive millimeter-wave camera using a pixilated array of sensors. “One pixel involved in the camera is a thermal sensor called a microbolometer. I will study the electrical property of phase change material VO2 to improve the sensitivity of the sensor. In addition, I will implement micro-electro-mechanical systems (MEMS) suspension process to further improve the overall performance of the sensor,” she said. In addition to research, the project includes the development of new courses at Ohio State, undergraduate and K-12 summer programs and outreach for underserved students across Central Ohio. Originally from China, Chen said her father is an engineer and this became her interest as well. She started in Mechanical Engineering and found her way toward microsystems along the way. As a high schooler in Hilliard, Lust said he found an interest in electromagnetics and physics early on and sought out working with Ohio State's ElectroScience Lab as an undergraduate. The Ohio State ECE Department Assistant Professor Vanessa Chen also recently won the NSF CAREER award for her work in machine learning and cybersecurity. The CAREER Program offers the National Science Foundation's most prestigious awards in support of early-career faculty who have the potential to serve as academic role models in research and education and to lead advances in the mission of their department or organization.